For Darlene Henderson, life in Round Top, Texas feels much more safe and secure than it did in Houston. Her teenage son has been removed from the rough crowd he was spending time with in the city, and she and her husband are making plans to renovate their old farm house. Darlene’s so comfortable with her family life that she’s given up being a stay-at-home mum and started working at a school for disabled children. So she’s entirely unprepared when a series of catastrophes hit her family. Her seemingly perfect teenage daughter is revealed to have been self-harming for quite some time, a secret her brother was keeping from their parents. No one understands the enormity of what Grace has been going through, least of all Darlene. Her husband, Brad, is determined to sweep this situation under the carpet and deal with it without any outside help that might damage the reputation of their family. Brad’s reaction stuns Darlene, and his insinuations that Grace wouldn’t have been so destructive if Darlene spent more time at home drives an unexpected wedge between them. To complicate matters further, the father of a child at her school is starting to pay Darlene a lot of attention, at a time when she most needs someone to lean on. Darlene is struggling to stay strong and make decisions about Grace without the support of her husband, and needs all the help she can get to stay away from the open arms of another man. 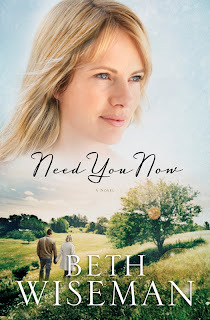 Having recently become a fan of Beth Wiseman’s Amish fiction, I couldn’t help but be intrigued when I heard that she was releasing a contemporary novel, and a non-romantic one at that. Contemporary women’s fiction is a genre that is slightly lacking in the Christian market. There are some writers who approach this genre very well, but I’ve yet to encounter anyone who can rival Barbara Delinsky or Diane Chamberlain in their complex plots and family dynamics. While Beth’s debut into this market didn’t excite the same reactions in me that Barbara’s most recent instalments have, I will admit that it was incredibly compelling. I devoured it in two days straight, and I honestly think I need to go back and reread the last few chapters as I was struggling to keep my eyes open at the end, but determined not to go to sleep until I’d finished the book! I didn’t have any major expectations for Need You Now, as I imagined it would be very different from Beth’s Amish fiction. But she has lived up to her trademark of complex, realistic characters with believable struggles, even in a contemporary setting. I was even more impressed by the way that she approached her teenage protagonists. Some brilliant authors have let me down in their portrayal of teenagers – notably, Jodi Picoult’s The Pact, which I repeatedly wanted to throw across to the room when I read it as a sixteen-year-old – but Beth does not join their ranks. While I never suffered to the extent that Grace did, I did struggle with unexplained feelings of depression throughout my teen years, which has now been diagnosed as Seasonal Affective Disorder. Even now, I can’t put my emotions from this stage of my life into words. Somehow, Beth has managed to explain how overwhelmingly confusing teenage depression can be, making Grace an incredibly relatable teenage character. Grace’s older brother, Chad, was equally realistic, although I felt that Beth could have developed his character a little more. There are hints that Chad is possibly going to head down the wrong route, like he did in Houston, and although he makes some positive choices towards the end of the novel, his character never had the depth that Grace’s did. Likewise, I did mostly enjoy the storyline about their neighbour, Layla, but she sometimes felt a bit caricatured. Her relationship with Darlene was very touching, but I think the fact that this novel attempted to focus on so many different characters meant that some of them – particularly Layla and Chad – were a little neglected and didn’t seem quite as fleshed out as Darlene and Grace. Some readers may find it difficult to read about the struggles Darlene and Brad’s relationship faces, and the temptations that Dave presents her with. Need You Now illustrates how dangerous a seemingly innocent relationship can become when it starts to provide that which your marriage cannot. I will admit that I got a bit annoyed at Darlene towards the end of the novel. She overhears a phone conversation with her husband and makes several assumptions, but takes a long time to confront him about it. I know that this is probably the way that many women would react, but I’m not that kind of woman. But although I couldn’t relate to Darlene in this particular incident, I will say that for the majority of the situations she found herself in, I could emphasise with her. I do wish that Dave’s character had taken a different turn. He was painted so sympathetically at the start of the novel – a widower with a challenging daughter who just wanted to find love again – but I felt he almost became somewhat of a villain, and Darlene the victim. Of course he was wrong in coveting a married woman, but if Darlene can be forgiven for her mistakes, so can he. I wanted some hope for Dave at the end of the novel, but there wasn’t any. Perhaps Beth will write another novel about Dave’s redemption? Beth’s debut into the contemporary market is strong, and hopefully a sign of better things to come. Her characters are just as realistic and relatable as those in her Amish novels, and she continues to address controversial issues that some authors shy away from. While perhaps the number of topics that come up in this novel might seem a little overwhelming – self-harm, adultery, death – the novel ended on a hopeful, uplifting note. I think the only major pitfall of Need You Now is that the novel has a large cast, and some of the characters seemed less credible than others. A few characters could have benefited from some further development, but perhaps this had to be sacrificed for the sake of the main storylines. But hopefully this is something that Beth can improve on in later novels, of which I’m sure there will be many. Fans of Beth’s Amish fiction will likely enjoy this foray into a new genre, and those who can’t bear to pick up a novel with the bonnet on the front will now also get the chance to enjoy Beth’s challenging yet uplifting stories. Review title provided by Thomas Nelson. It sounds like we had a very similar reaction to the book. I thought Grace was very well developed but Layla less so. I enjoyed the treatment of Brad and Darlene's marriage. I just read your review over at TCM and think we're probably on the same page with this one. I agree with what you said about the pacing - I think Chad should either not have had a POV in the book, or have been more developed. Maybe Dave as well. It was a bit annoying to get a little snippet of their perspective, and then nothing. I agree - Grace was excellent, but Layla was not so believable. I got frustrated with Brad and Darlene in places, but ultimately they came across as a realistic married couple.